Huntsville, UT – With the crowds of the Winter Dew Tour there to cheer them on, contestants at the Gatorade Free Flow Tour Finals took to the professional Dew Tour courses this past weekend in prospect of being crowned the 2012 Champion. 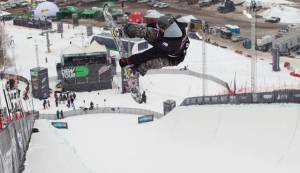 Topping a competitive field of the nation’s best snowboard and freeski amateurs, the slopestyle finals saw Andy Partridge in ski and Brooke Voigte and Kent Callister in snowboard take the top spots, earning a pre-qualified place on the 2012-13 Winter Dew Tour. Sunday saw down-to-the-wire superpipe contests as snow began to fall on Utah. Callister doubled his win, topping the podium for the second day in a row, along with Kelly Berger in snowboard and Broby Leeds in freeski. On Friday afternoon, the freeskiers cleared the professionals from the slope course at Snowbasin as they went head to head and run for run for first place. Earning the win with an impressive run was Park City local Partridge. The youngest skier of the day was spot on with his 270 on the down-rail, frontside switch-up to backside 270 on the up-down rail, and 270 off the cannon rail, followed by a clean right 900 and big switch 1080. On Saturday the snowboarders took to the rails and immaculate jumps, where Voigte and Callister proved they were ready to make the step up from amateur status. With a 50-50, 50-50 frontside boardslide, tailgrab off the cannon rail, frontside 360, backside 180, Voigte earned her spot in next year’s Winter Dew Tour. Closing out the day, Callister kicked off a weekend of success with his frontside lipslide on the first rail, boardslide to fakie on the 2nd rail, cab boardslide 270 out off the cannonbox, cab 900, frontside 1080. As the snow finally started to fall on the slopes of Snowbasin, the snowboarders and freeskiers took their best tricks to the pipe. The women went first, where Berger made her first trip to the finals worthwhile. Her front five, back five, clean straight airs and front seven to cab three earned the highest marks of the contest. Followed by the men’s snowboard division, the contest came down to everyone’s second runs as they proved their abilities were made to “Flow to Pro,” the theme behind the Free Flow Tour. Callister, who took the slopestyle win less than 24 hours earlier, smashed the competition with a score that led the next contestant by four points. His straight air and front ten were a clean start to his cab seven, front nine, back nine and five. The freeskiers took to the 614-foot long pipe last, proving to the supportive crowd that the show was not over. Leeds, a three-time Finalist, earned the victory with his nine hundred to alley-oop nine hundred, 720 tail to switch alley-oop 720, 540, right 540, and finished with a boosty 1080. Competing on the largest pipe in the world was no problem for the 18-year-old. “I added a couple hits, didn’t have to add in anything new but worked on performing them better,” Leeds said. With their wins at the Gatorade Free Flow Tour Finals, Partridge, Voigte Callister, Berger and Leeds will make their professional contest debut at the 2012-13 Winter Dew Tour, where they will compete against the biggest names in their sport. 2. Samuel Viseur, Centennial, Colo.
3. Max Szekely, Redwood City, Calif.
4. Ian Hamilton, Missoula, Mont. 5. Noah Wallace, Spokane, Wash.
2. Nirvana Ortanez, La Jolla, Calif.
5. Kelly Berger, Mammoth Lakes, Calif.
1. Kent Callister, Bend, Ore.
2. Mark Reninga, Fredonia, N.Y.
3. Wylie Adams, Carbondale, Colo.
5. Armeen Pirooz, Harrisonburg, Va.
1. Broby Leeds, Vail, Colo.
3. Hudson Knoll, Hood River, Ore.
4. Conor Garrecht-Connelly, Steamboat, Colo.
1. Kelly Berger, Mammoth Lakes, Calif.
2. Kirby Kelly, Chicago, Ill.
3. Noelle Edwards, West Dover, Vt.
4. Shannon Branthoover, Indian Head, Pa.
5. Maggie Leon, West Simsbury, Conn.
3. Brandon Davis, Mammoth Lakes, Calif.
4. Spencer Whiting, Mammoth Lakes, Calif.
5. Max Jenson, Rye, N.H.